One of the most effective tools in keeping the basement of your home or building dry is a sump pump. This is especially true if the area water table sits above the foundation of the property. Installed in the basement, the device will remove water that has accumulated in a water-collecting sump basin, and pump it out to a drainage point that is far enough away from the foundation of your home – like a municipal storm drain. Even if you are just noticing dampness in the basement – a sump pump is an important tool in protecting your property, one that we highly recommend to all our waterproofing clients. Installing a sump pump in the basement of your home or building is an extremely effective way of re-directing water away from the foundation and footings of the property. A sump pump is a popular choice among our clientele. Heavier and more frequent rain showers combined with increasingly unreliable municipal sewer infrastructure translates into a need to get proactive and ensure tools are in place that will keep your basement dry. Call us today for a free estimate. It’s a pump that re-directs water from a water-collecting basin that is part of your weeping tile system (the porous pipe installed around the foundation that collects and discharges underground water), located in the basement of a home or building. The water is pumped away from the building’s foundation or footings, to a location far enough away from the structure. There are three main features: a tank that holds the water that is drained from a weeping tile; a pump that pushes water up and out of the basement to a drainage point; battery back-up and alarm system in the event of something like a power outage. A crew of professional waterproofing contractors from Canada Waterproofers will first disconnect the old weeping tile connection to the city sewer system. This will avoid flooding in your home or building. The sump pump will be installed inside the basement along the wall. Our crews will excavate and remove the soil, install a water tank, connect the existing weeping tile to the side of the tank. We’ll encase the tank in gravel, re-cement around the tank, install a submersible pump, then test the system. If it meets our standards, we’ll put a lid on the tank, and bolt it down. Rest assured from that point forward any concerns about a damp basement or flooding will be a thing of the past. This is another tool that we highly recommend to clients that will keep your basement dry. A backwater valve is a device that prevents outbound water from the home or building to re-enter through the drain pipes in the event of a heavy rain or snow melt. A nightmare scenario that we have all heard about is when not just water but raw sewage backs up into the home, through toilets, sinks and showers. A backwater valve removes that risk. Municipalities and insurance companies are now encouraging home and building owners to install mainline backwater valves. A city-approved backwater valve features a drainage slope to better enable flow of water from the home, and an internal flap that floats up to block any back flow from the sewer, saving your home or building from sewer water and waste. A clear top on the device allows for easy inspection by a Canada Waterproofers’ crew member. The device is designed for easy cleanout by the technician.  The crew from Canada Waterproofers will excavate where the sewage connection leaves the house, either inside or outside the foundation wall, usually at the front of the home or building. After the device is installed (it has to be a maximum of three feet from the front wall), our crew will put in gravel to support the pipework, then back-fill and compact the ground. Last step is concrete finish for the inside or gravel finish if the work is done on the outside, followed by clean up.